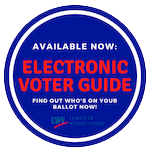 To join the League of Women Voters of the Hamptons,just download this Application for membership and mail with your check to LWVH, P.O. Box 2253, East Hampton NY 11937. Questions? To inquire about the League, please call 631-324-4637 or e-mail us.